It is said that a picture is worth a thousand words. But what’s a picture worth to your online store? Absolutely everything. Without crisp, clear images of your products, customers may be hesitant to place an order. A fuzzy, out-of-focus picture could prevent those ever-important online purchases. Ecwid also allows you to upload multiple pictures so you can show different angles, close-ups or your product in use. So what’s the best way to snap photos like a pro? Several factors play a role, but two key concepts are equipment & environment. Equipment — make sure your camera has a capable zoom function. Megapixels are crucial, too. We recommend a digital camera at least in the 7 MP range. Anything less, and be prepared for fuzzy, off-focus snapshots. Anything more, and the cost benefit quickly fades…sure, you can pay a thousand bucks for a 21 MP camera, but the average online customer isn’t going to see the difference. That said, if your business is photo-dependent (for instance, a wedding photography company), by all means don’t hesitate to go with a larger MP count. But 5-7 should suffice for typical products and services. Environment — how’s the lighting in your room? Is the weather dreary? How about the background surface? By optimizing the context around your photo subject, you’ll produce a better overall picture. And even with advanced flash capability, you just can’t beat a superior light source (other than your camera’s flash). In most cases the best background for product photos is an all-white background and even required by some marketplaces — like Amazon. Using all white will give you the best flexibility for design and allow you to match both Google and Amazon’s background. Size — Once you have the camera and the background in place you will want to be able to upload the photo into your Ecwid product page. We will automatically resize images if necessary. Try to frame your shot as a perfect square as this is standard for e-commerce layouts and also for comparison shopping engines. The main secret of good looking store is to have big thumbnails. The thumbnail image can be increased on the System Settings → Design → Thumbnail Sizes page in our control panel. Sometimes, that perfect photo is just too elusive. For professional-style touch-ups, try a photo editing software package. Many are available for under $100 — a small upfront cost that can potentially pay huge dividends for your e-commerce business. Some popular photo editing software bundles include Corel PaintShop Pro, Adobe Photoshop Elements and Serif PhotoPlus. With these guidelines in place, it’s also important to know what NOT to do with your online store photos. Avoid different-sized thumbnail photos of your products, if possible. 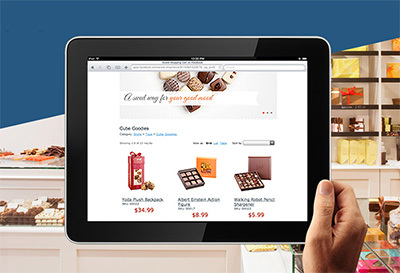 As customers browse your products, constantly changing photo sizes can be a big turn-off. Another common mistake, especially for novice photographers, is describing a feature in a product’s tagline or description, but not showing it off in the accompanying photos. If your copy talks about a particular attribute, make sure your photos provide visual proof. These are just some basic considerations for snapping online store photos. Remember, your pictures are a crucial element of website content. First impressions are everything, especially when a new (potential) customer visits your online store. Those first few moments matter — make them count with great product photos! And now that you have a basic grasp of efficient, effective photo taking techniques, the only thing left is…SAY CHEESE!